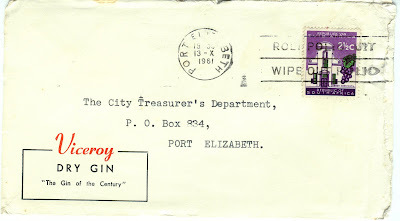 This is the second batch from my collection of old Port Elizabeth envelopes, as explained in the introduction alongside. 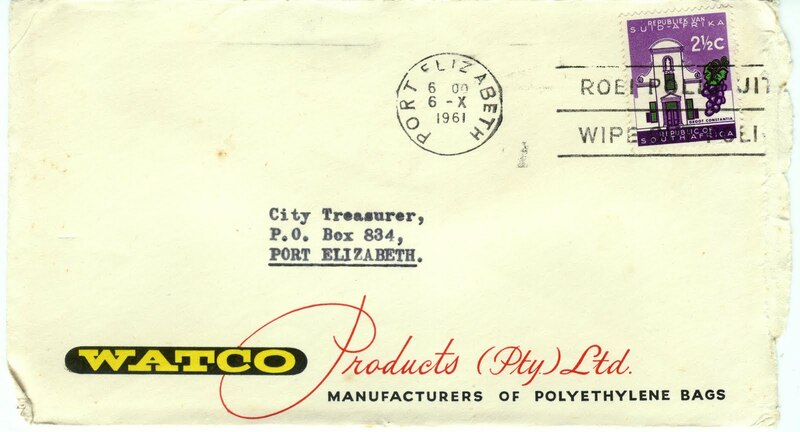 Apart from the aesthetics of nicely composed envelopes, one of the interesting parts of this exercise is ascertaining how many of these companies still exist in Port Elizabeth, 50 years on. So here was another firm which had its name specially printed, in colour, on its envelopes. 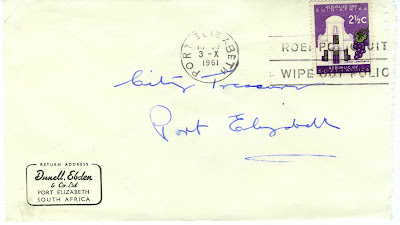 Such was the importance of what we today call "snail mail" in those days. 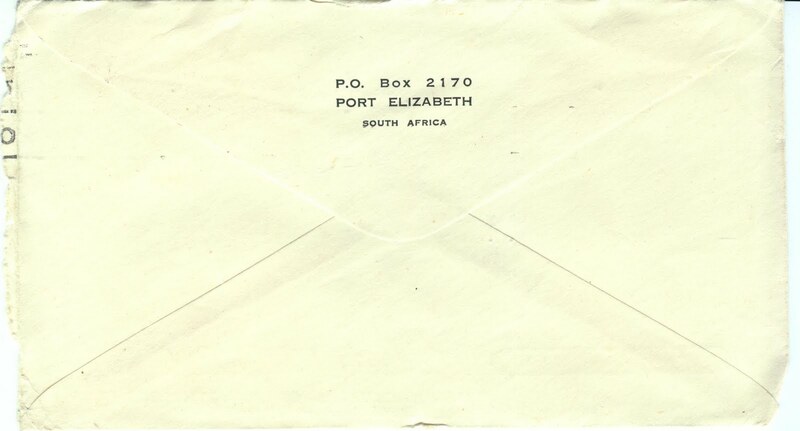 This is the first of the batch that has been typed, on an old manual typewriter, no doubt by a trained secretary. 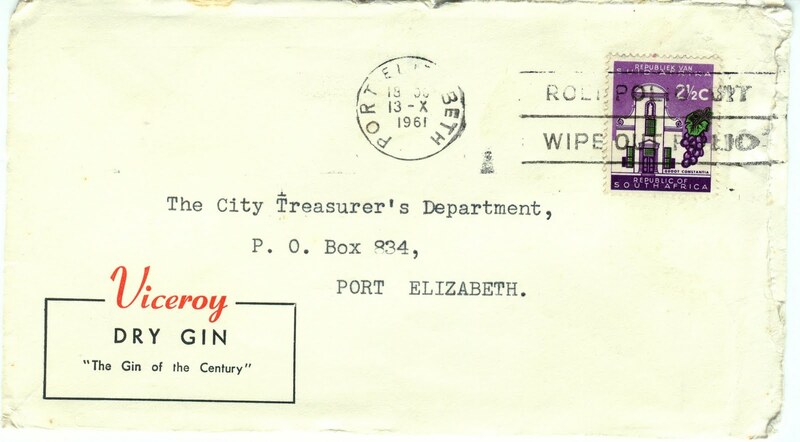 I have also ascertained from the latest telephone directory (2010) that the Budget & Treasury Directorate of the new Nelson Mandela Bay Municipality (of which PE is a part) still uses the same PO Box number, 834. Wikipedia tells us that the large island off southern India now known as Sri Lanka was called Ceylon until 1972. 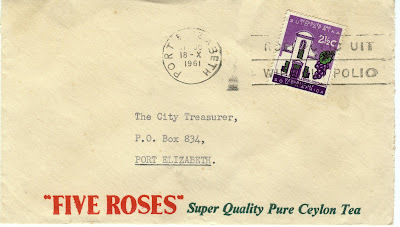 I love the five roses illustration printed on the back of the envelope. 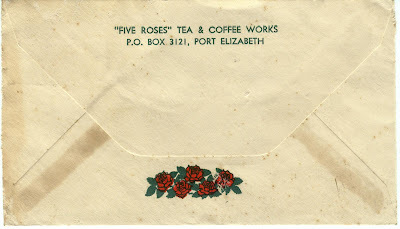 A check in the phone book reveals no listing for "Five Roses" Tea & Coffee Works in PE. Here, interestingly, the address of the firm's Johannesburg office has been crossed out. 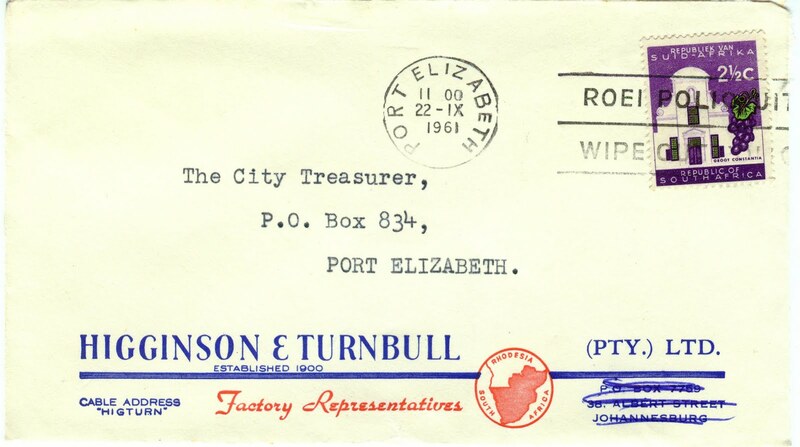 I see there is a "cable address", bottom left, and that the firm, established in 1900, were factory representatives. 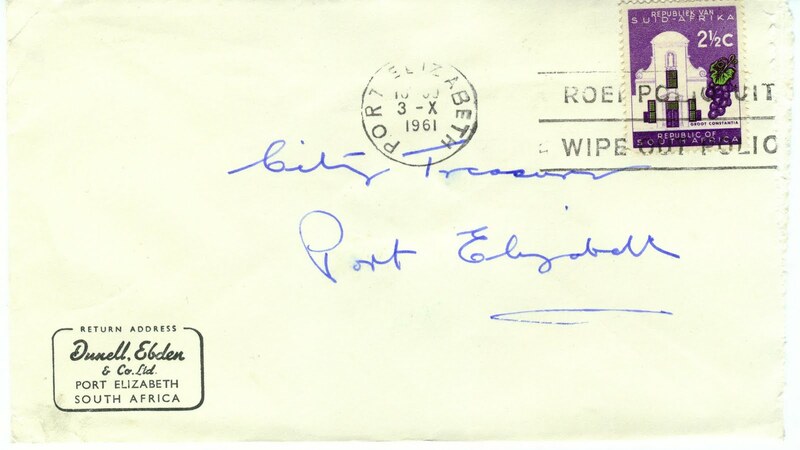 The map shows "Rhodesia" and "South Africa". 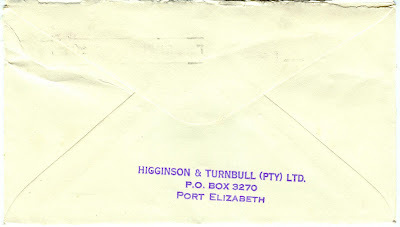 It was a costly two-colour printed envelope. 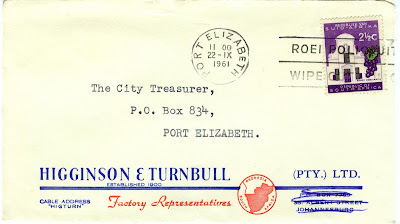 They had a PO Box number back then, but there is no sign of the firm in today's phone book. 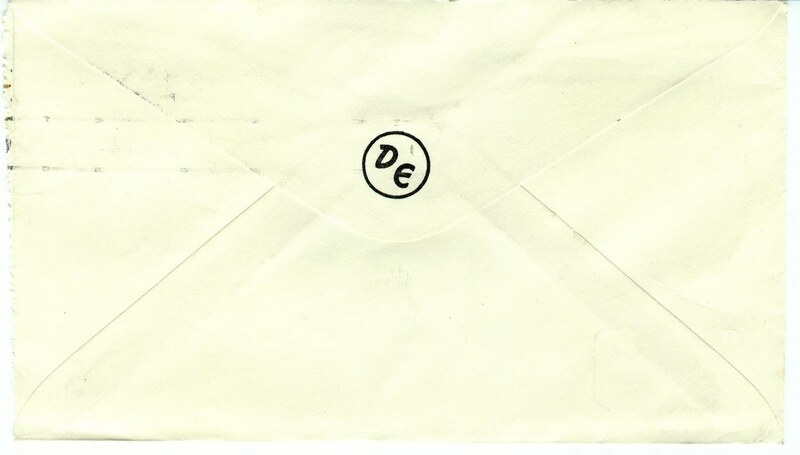 Some firms used deliberately understated livery on their envelopes, such as this from Dunell, Ebden & Co. Ltd. They, too, are no longer in the phone book. I wonder what they did? The very understated back of the Dunell, Egden envelope. 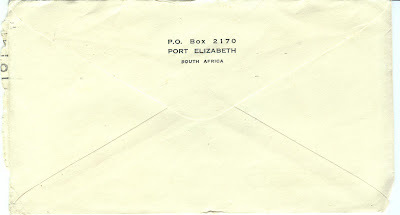 Another expensive, three-colour printed envelope, with the address neatly typed. A check in the directory reveals no Watco Products. Wikipedia tells us polyethylene, or polythene, is the most widely used plastic, mainly used for plastic bags. First synthesised by a German chemist Hans von Pechmann by accident in 1898, two English scientists Fawcett and Gibson put it to industrial use from 1933 - again thanks to an accidental synthesis. 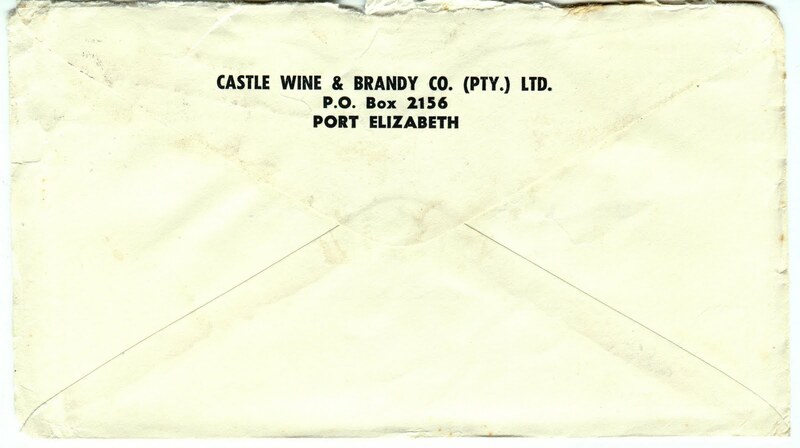 A check of the phone book reveals this company, too, no longer operates in PE. Another firm that has printed its bit of advertising on the envelope. 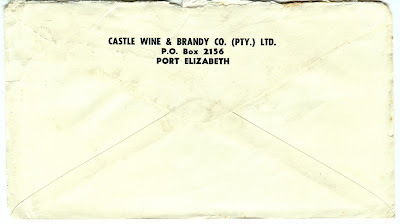 A check in the phone book reveals Castle Wine and Brandy are also no longer in PE.